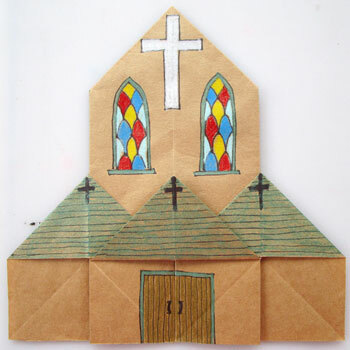 This month’s origami model is a variation of a traditional origami “church” which is included with the diagrams, so you get two-for-one!. 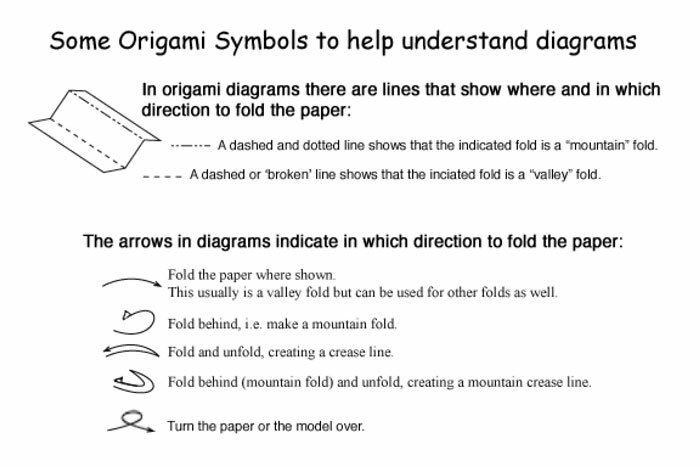 The folding sequence is the same except for the final step. The main difference is how you decorate the results. 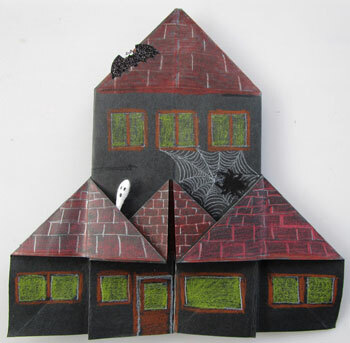 For the Haunted House I like to choose a dark paper and for the church version I begin with colored or white paper. For either model add details with colored pencils or markers. Cut-out shapes and stickers are also fun to use to decorated your work. 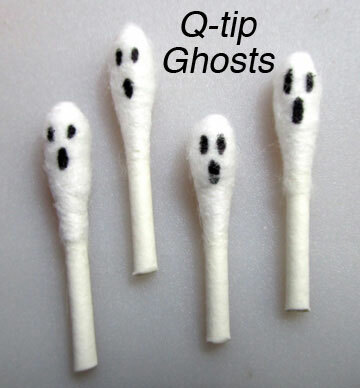 A favorite add-on item is a Q-tip ghost - this is made by cutting off part of a Q-tip and adding dots for eyes and mouth with a fine-tip pen or marker, then attaching to your house. 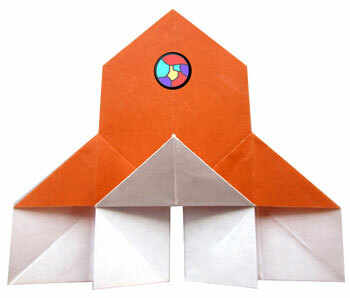 For best results with this model begin with a large square of paper because the end result will only be half the size of your unfolded paper. 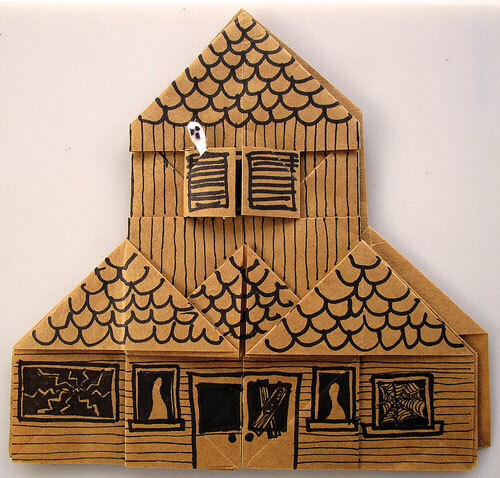 For example, folding the most common 6” origami paper will result in a house only 3” high and 3” wide. 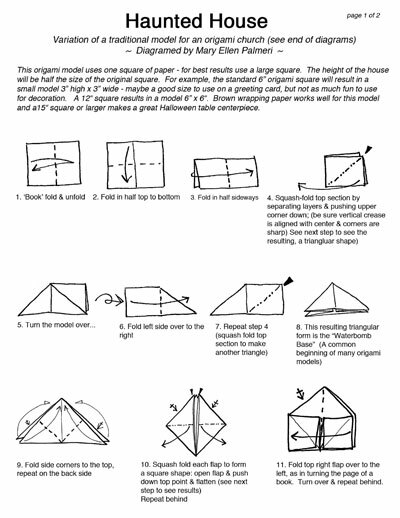 For a larger model use 12” square scrapbook paper if it is thin enough to fold. Also try gift wrap or brown Kraft paper which comes in a roll (try an office supply store). Decide the finished size for your needs, then measure and cut a square twice that size.